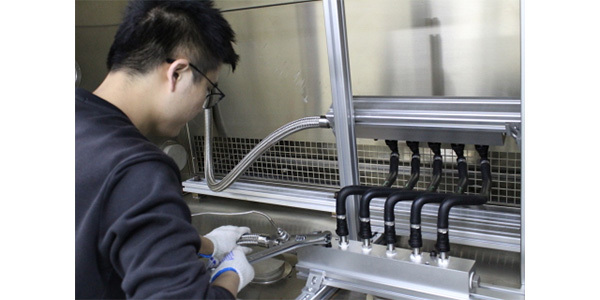 Fluid transfer system component testing at Smithers Rapra’s new Suzhou product testing lab. Smithers Rapra, a world leader in rubber, plastics, and composites testing expertise, is opening a new product-testing laboratory in Suzhou, China. The new 4,000-square-foot facility provides air leak and burst, cleanliness, material properties, salt spray, and pressure, vibration and temperature (PVT) testing. The new laboratory will be positioned to support the quickly evolving automotive market in China with fluid transfer system expertise. This lab will combine with existing labs in Akron, Ohio; Lansing, Michigan; and Shawbury, England, to support Smithers’ global clients. The laboratory will be able to support vehicle OEMs and tier suppliers with validation testing for a wide variety of fluid transfer systems used on the vehicle. From brake and fuel lines to coolant hoses, radiators and turbochargers, the experienced local team can test to international and OEM standards as well as develop custom benchmarking programs to support R&D efforts. Smithers Rapra operates laboratories in North America, Europe and Asia, covering a wide variety of testing and consulting services from material chemistry and product durability testing, to tire, wheel and winter testing.